Okay, so we're two weeks into Buckeye Season. I've already hit my mom up for a batch of her famous Buckeyes which Adam loves. 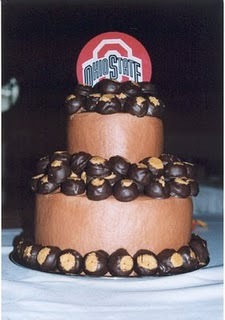 When we got married (back in 2002) I had a Grooms Cake made for Adam and my mom covered it with Buckeyes. In total we had over 900 Buckeyes at our wedding and Mom made every single one of them. Weddings and parties are in full swing. Recently Denise Busic, one of my clients, threw a "Knights and Dragons" party for her son Colin who turned 4 in August. Ofcourse she needed a perfect invite to match. According to Denise, "They pelted the 4ft dragon with 300 water balloons. They were vicious! The pinata took forever. The girls gave him a good beating. I've been told to sabotage it in the future. They made shields for their family crests as a craft. And my neighbor drug over her bouncy castle. " Sounds like an awesome day for everyone. Other exciting news is that I recently purchased a corner rounder. I have three dies to make different levels of corner roundness. It's a really fun tool and it gives an extra something to some invites. I've also been searching for new paper and ribbon. Almost everyday the nice UPS guy brings me something new. I've been promising pictures of brides - I have a few saved up for another post. What else? Well my friend Kat and I enjoyed a nice shopping spree on Sunday at the Flower Factory in Dayton. I have lots and lots of ribbon now. Beautiful burgundy, burnt orange, browns and greens. All beautiful. Kat is gearing up for the Fall Harvest Festival being held this weekend at Lake Loramie. She's having a booth to peddle her yarn and jewelry and she's been kind enough to make room for my notecards as well. In addition to notecards I will have my "Bag of Scrap" which is essentially a ziplock bag full of odd and ends, pretty papers, bits of ribbon, buttons and whatever else I sort of forget about but am relunctant to throw away.